As rumors of an IPO swirl and competition heats up, the world's biggest streaming music service unveils major changes to its user interface. 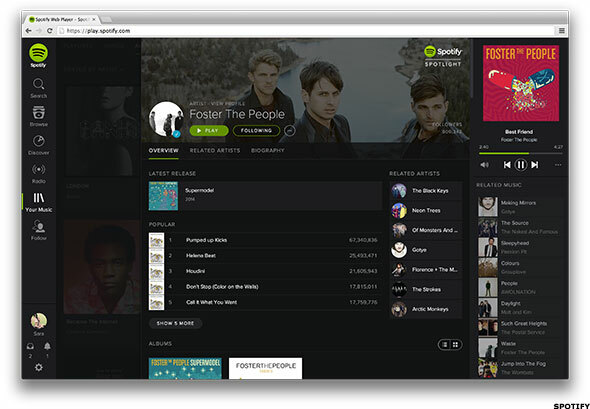 NEW YORK (TheStreet) -- Spotify Wednesday released an updated user interface, its first-ever major redesign. The new design features a black background, designed to make the huge variety of album art pop, like a spotlit star on a dark stage. The new look does away with a couple buttons at the bottom of the old Spotify screen and presents all of its options in a single left-hand column. The player controls, which used to be squeezed into the upper right corner, are more logically spread out along the bottom of the screen, making the timeline scroll easier to use and more functional. The layout makes better use of the main section of the screen, presents songs and album lists more cleanly, making it easier to navigate and browse the service's 20 million-plus tracks. It also makes the interface more consistent across mobile, Web-based and desktop platforms. The biggest change for most users, though, will be the "Your Music" choices in the lefthand column. A "Save" option on each song allows the user to store the title in that queue, giving easier access to favorite playlists, songs and albums, as well as soundfiles stored on your device, in one place. The mobile app has all these functional changes and sports the same black-screen theme but is designed to maintain the feeling of cleanliness while playing to the strengths of the handheld's smaller screen. Those changes support the main thrust of Spotify's outlook, which emphasizes streamlined content delivery, avoiding heavy-handed marketing. That has always been apparent in the uncluttered look of its user interface and, even now with more options available, the new design still pushes function over form, playing down stylishness for its own sake. "We're a product-driven company," Ken Parks, Spotify's chief content officer told TheStreet at an interview at SXSW in March, where he offered us a sneak peak at the redesigned Web-based platform. "We haven't been marketing driven. . . . we've always put our emphasis on making the best product possible, because users have a lot of options." 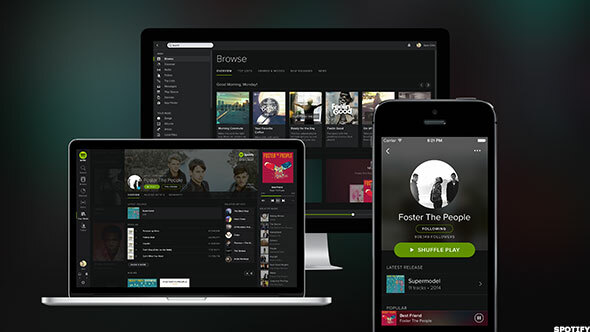 The redesigned look comes at an important moment for Spotify's development. Already the largest streaming music service and most internationally based, Spotify is likely to go public this year. Rumors are that the announcement could come soon and the IPO could be scheduled for the fall. Currently Pandora is the only publicly traded company exclusively devoted to streaming music. Competition in the space is heating up, however, with Apple's (AAPL - Get Report) iTunes Radio and Beats Music launching in the last six months. However, Parks played down the notion that the redesign or any other effort by Spotify might be a response to direct pressure from outfits like Beats, which sported a similar black background when it launched in January. Parks and others with the company pointed out that the redesign had been "incubating" long before the Beats launch. "These things don't happen overnight," Parks said.